Earlier this year, Me Before You was released in cinemas. The film, based on JoJo Moyes’ 2012 best-selling book, explores the decision of a man who wants to end a life because of a severe disability. Will Traynor (played by Sam Claflin), who became a quadriplegic in a pedestrian accident, wants to end his life. His mother hires Louisa Clarke (Emilia Clark) to be his company – to give him hope. While their relationship flourishes, Will still goes ahead with his decision to end his life. A number of disability activists protested Me Before You outside cinemas, and by writing articles and social media posts. It was the most concentrated, global media collective of disabled people I’ve seen. It was galvanising. “As a wheelchair user, I am deeply concerned that this film perpetuates these messages: that the lives of people with disabilities are not worth living, and that people with disabilities cannot be worthy partners. It places people who have newly acquired disabilities, or young people with congenital disabilities who may be experiencing depression and grief as a result of this at further at risk of self-harm or suicide. While the protest in Melbourne featured less than 20 people, including myself and Jax, it was strong. A number of protesters talked to cinema goers about the problems we had with the film, and me and a few others spoke to the media. I called for better representation of people with disabilities, so that audiences don’t pity us. Disabled activists speaking up about the problem with Me Before You showed people that we want to be heard, and that we want the film and TV industry to change. The media took notice. Me Before You is one of many films and TV programs to portray disability as a tragedy. The only reason Will Traynor wants to end his life is because of his disability. Yet as a viewer, it’s easy to see he has so much to live for because of the love he and Louisa have. One of the issues I had with Me Before You was that a non-disabled actor played a disabled character. This is an ongoing problem in TV and film. From classic Rain Man and What’s Eating Gilbert Grape to the TV show Glee, the new Netflix film the Fundamentals of Caring and the upcoming Rosemary Kennedy biopic – actors without disabilities are “cripping up”, as the late Stella Young termed it. Pleasingly, Channel 10 show Neighbours is extending its commitment to diversity inclusion by casting former Prisoner actor Kate Hood as Maxine Cowper. Kate is a wheelchair user, and a very experienced actor. “My role in Neighbours (Maxine Cowper) started shooting recently – and incredibly, I worked with a director I know well from my Prisoner days”. Kate said. “So wonderful to be back in exactly the same building that Prisoner was shot in – although of course it is much changed, as am I. And there is the nub of it for me. At last a major Australian TV series, which is seen globally, has taken the step of casting a disabled actor to play a disabled person. It seems that we are finally catching up with the rest of the world. I strongly believe the perceptions of people with disabilities will change when we are better portrayed – and included – on screen. I will never settle for the excuse that a non-disabled actor is the best person to play a disabled character. The Disability community responds to Me Before You movie with protests across three continents. Carly Findlay is a blogger, writer, speaker and appearance activist. 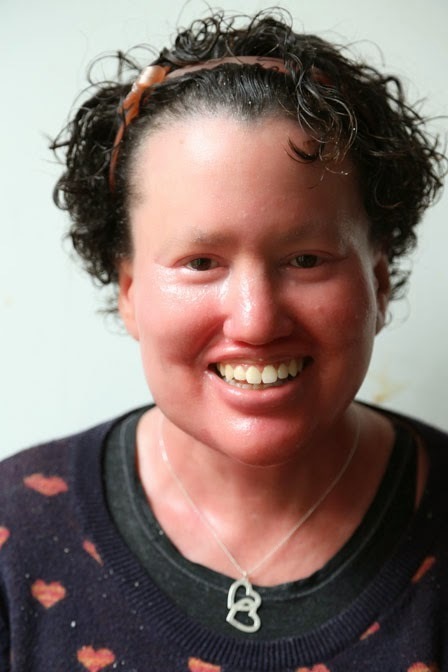 She challenges people’s thinking about what it’s like to have a visibly different appearance. She’s written for many publications including The Guardian, Daily Life, The ABC, Mamamia, Frankie magazine and BlogHer. She’s used her blog to write about her skin condition, Ichthyosis, as well as promoted causes such as Love Your Sister and Donate Life. Most recently, Carly was named as one of Australia’s most influential women in the Australian Financial Review and Westpac 100 Women of Influence Awards for 2014.